COGS: Cyclists of Greater Seattle — C.O.G.S. is distinguished from other clubs in how we develop camaraderie and friendships through biking. This includes social events with a focus on cycling and good times. Whidbey Island Bicycle Club — Formed in 2010 to support road and trail riding on Whidbey Island. 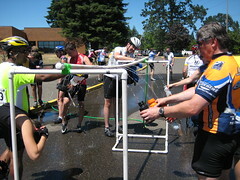 West Sound Cycling Club — Supports advocacy and bicycling in all counties west of the Puget Sound and sponsors the Tour de Kitsap. Valleyfest presents the Third Annual Spokane Valley Cycle Celebration Sunday July 26. The Cycle Celebration has three rides to choose from: a 10-mile Family-Friendly Ride, 25-mile Adventure Ride and a 50-mile Hills Around the Valley Ride. No matter what your level of expertise is, you can enjoy cycling, get some exercise and enjoy the beautiful nature that the Spokane Valley is known for. Adult and children registration $20.00 includes one shirt per person. $8.00 registration for children (does not include shirt) Stay after the ride and meet your fellow riders, food and beverages available. For online registration register at CycleCelebration.com. For more information or call the Valleyfest office at 509-922-3299. We look forward to riding with you. All participants must wear an approved helmet. SCOPE will be there handing out free helmets while supplies last. Children under the age eighteen must have a signed waiver by a parent. Parents must accompany children under age sixteen. Packets will be available at CenterPlace on Saturday, July 25, 4PM – 7PM. Out-of-town visitors may pick up their packets between 6AM – 7:30AM on Sunday, July 26. You may register before or on Monday, July 13. For late registration a $10 fee will occur for each registrant. The Point Loma Rotary Club is hosting the 5th Annual Jim Krause Memorial Charity Bicycle Ride on November 11, 2017 to benefit pancreatic cancer research. The ride begins and ends at Liberty Station and includes 10, 25, and 62 mile scenic routes through Point Loma, Ocean Beach, Mission Bay, Mission Valley, and Mission Gorge. The event includes an after-ride healthy lifestyles festival with booths, entertainment, and refreshments. The event will be advertised in local, state, national, and international venues and attracts a diverse demographic of visitors. Over 70% of last year’s riders from outside the local community including central and northern California, Arizona, New Mexico, Oregon, and Utah. Our VIP riders include local, state, and federal community leaders and media personalities. This is an all-volunteer event with proceeds staying in the local community to fund pancreatic cancer research at UC San Diego Moores Cancer Center and other Point Loma Rotary Club civic projects. Please join us in making a difference in our community. For more information on the event please visit our web site at: http://www.RideThePoint.org.